Fashion photography is one of the most well-known types of photography. It is probably among the most desirable fields. Fashion photography focuses on showing clothes, accessories, and other fashion items off and displaying them. Most of the time, it is for the advertisement of certain clothing lines and brands. It is a genre that almost everyone is familiar with, especially in the present era. With the latest technology that we have now, it has been a trend to artists, ambassadors, models, photographers and even bloggers to post their own fashion photographs. The question almost everyone interested is asking is “What is the best lens for fashion photography? Of course, fashion photographers want to have their shots and printouts to come out as perfect and as flawless as possible. This is to achieve the image’s purpose, whether it is for advertisements or just for display. Because of that, they are in search of the best lens that has great features to achieve the greatest shots. Before the best lens for fashion photography list starts, there are several things that one has to consider when choosing the right lens. The first one is the focal length. Light gathering and depth of field are also two of the most important things to check before deciding what lens is for the said genre. Light gathering and depth of field could be both achieved if the lens that is used has a wide aperture. Light gathering is needed to allow fashion photographers to capture in higher shutter speeds. Meanwhile, depth of field is when the focus is only on one object or part of the image, and the rest is made blurry. This is to achieve a bokeh effect. In short, one should be mindful of the lens’ focal length, light gathering, depth of field and aperture. Minor factors would also include its weight, size and motor features. Fashion is something making an item or looks incredible and amazing with the light, background and other features. One can’t achieve this goal with only a good camera. Along with a camera, you need to get yourself a good lens as well. Otherwise, you can’t give your viewers best experience. In fashion photography, small details matter a lot. So, you might need to zoom a lot title, do up and down shots. While purchasing keep these points in mind. It has a minimum focusing distance of 1.15 ft or 0.35m and a maximum magnification of 0.21x. This lens is good for portraits, action, and nighttime photography. This Canon lens is lightweight and compact. Photographers can easily bright this lens with them to shoot. It is updated and has a new exterior design, so it already has a focus ring placement. 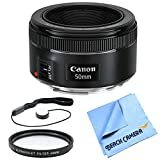 This focus ring placement allows manual focus adjustments a breeze. It also has a metal mount that helps provide stability and ruggedness. This lens is the perfect one for those who want to expand the creative possibilities for their craft using their EOS cameras. 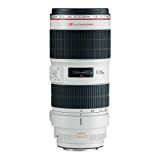 The second on the list is 24-70mm f2.8L USM Zoom Lens, it has got some amazing features here are the details. This lens is the best Lens for Fashion Photography with fast and versatile features. It can be used for quick shots. It has a focal length and maximum aperture of 24-70mm, 1:2.8. Its closest focusing distance is 0.38m or 1.25ft. Its filter size is 82mm. It has a new optical design as well. This is water and dust resistant, which will allow photographers to shoot in desired more creative areas. Even in harsh and rigorous conditions, photographers could still shoot using this. This lens also has nine-blade circular diaphragms which enhance the background, making it beautiful and softer. This has a zoom lock. This lock used for safe transporting of the lens. This lens is one of the most popular and acclaimed lenses in the Canon EF line. It has an excellent performance. This telephoto zoom is dust and moisture resistant and designed to keep on going even in the most challenging of environments. Its features include an increased speed and optical quality. Its auto-sonic focus motor provides a fast and noise-free autofocusing. This lens creates an attractive bokeh effect at f2.8. It has a truly round aperture hole that results in more pleasing out-of-focus areas. It allows the photographer to get nearer the subject without having problems with the image or the shot itself. It also has a two-mode image stabilization feature that could correct all types of camera shake. These features make it perfect for fashion photography. It has got wide angle and zoom option. It has a circular aperture to produce isolated background. This lens also has an ultrasonic motor which is great for autofocusing. It makes it easier and hassle-free since it is said to have more precision. This lens hood prevents unwanted light from entering the lens which causes flaring. It also protects the lens from unwanted dust and particles, and also from the impact. This lens has a focal length of 100mm. Its closest focusing distance is 1 foot. This type of lens could focus over the full range from from infinity to true life-size, or 1:1 ratio. Its ultrasonic monitor provides outstanding autofocusing speed even at distances. It has an ultrasonic motor that provides an outstanding AF speed at all focusing distances. Photographers can easily capture detailed shots using this type of lens. It features an advanced optical formula with a three-group floating element system for exceptional close-up performance. It also has internal focusing. This implies even when focusing at short distances, you could easily capture the subject without having to adjust your distance from it. This lens is known for its versatility, image quality and superb handling. This, by far, has the most number of features on the list. Because of that, the 100mm f/2.8 lens might be the best lens for a fashion photographer’s field. The list goes on since there are a lot of lenses that are good for fashion photography. Some have similar features, and some have more advanced features. To know more about these, below are some of the frequently asked questions about the lenses, as well as fashion photography itself. Focal length is the distance between the lens and the image sensor when the subject is in focus. It is a number expressed in millimeters. A higher focal length indicates a bigger zoom. A lower focal length, on the other hand, indicates that the lens could be used for wide angle shots. For example is the 18mm to 50mm focal length. The 18mm has a wide angle, and the 50mm is more zoomed. A photographer could zoom between 18mm to 50mm to have a variety of focus on the image. Come Frequently Asked Questions About Best Lens For Fashion Photography? The depth of field is also known as focus range or effective focus range. It is the distance between the nearest and the farthest objects that the photographer is about to capture. These objects are the ones that appear sharper in the image. There are a lot of ways to control the depth of field of a chosen lens. This is through the choice of aperture, distance, and of course, the choice of camera. If a certain lens has a relatively wider aperture and a closer focusing distance, this gives the image a shallower depth of field. And if it goes the other way around, the image will have a deeper focus range or depth of field. Do Fashion Photographers need to have a large or long lens? Or does having a camera and a lens that have a wide aperture fine? Using long lenses flatters the subject because of their greater working distance. A long lens is typically used for portraits. If by chance a photographer uses wide angle lenses, the outcome may not be as what is desired. The image may look funky, so it is common and preferred to use a long lens. This is based on the principle or effect of foreshortening. The farther the photographer is from the subject when using a long focal length, the perspective would be more compressed. No, it is not a trend that all fashion photographers should have the longest lens they could have. It just happened that these lenses are suitable for their field, and their shots would look better when longer lenses are utilized. Using these lenses, are there any techniques to create the best shot and/or portraits? It is quite difficult to have a signature look when capturing fashion photographs, but once a photographer gets a hold of his or her work, it would be easy. Doing researches about the technicality of cameras, lenses, lights and other equipment would help. There are certainly a lot of lenses to choose from. Of course, a devoted fashion photographer would want the best lens for his career. From lenses that have lower focal lengths to a higher one and from those which have a narrow aperture to those of a wider one, all of these vary and have specific eyes for detail. They all call for a certain purpose when it comes to photography which is in the decision of the fashion photographer. It would need and take a lot of effort in researching to find what lenses are good and what is not for their own genre. Enough knowledge of the technicalities, features, and highlights of the lenses is very important. He or she must know the different terminologies in order to pick the best lens. A photographer could not just simply buy a lens which is not suited to what type of output he or she would like to create, especially when considering the value of money.